Phosphatidylglycerol/Cardiolipin Assay Kit | Cell Biolabs, Inc.
Phosphatidylglycerol and cardiolipin are key cellular lipid components found in many cell types, such as mammalian, plant and bacterial cells. Structurally, cardiolipin is a diphosphatidylglycerol lipid with two phosphatidic acid moieties linked by a central glycerol backbone. In mammalian and plant cells, cardiolipin plays an important role within the inner mitochondrial membrane and represents about 20% of the total lipid composition. Measurement of cellular cardiolipin/diphosphatidylglycerol is useful for monitoring mitochondrial bioenergetic processes. 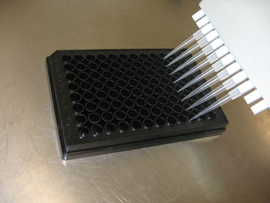 Our Phosphatidylglycerol/Cardiolipin Assay Kit measures both phosphatidylglycerol and cardiolipin in cell lysate samples by a coupled enzymatic reaction system. First, lipase is used to hydrolyze phosphatidylglycerol and cardiolipin to glycerol, which is then phosphorlyated by glycerol kinase to yield glycerol-3-phosphate. Next, the glycerol-3-phosphate product is oxidized by glycerol-3-phosphate oxidase, producing hydrogen peroxide. The hydrogen peroxide released from this reaction reacts specifically with the kit’s Fluorometric Probe and is detected at ex. 530-560 nm/em. 585-595 nm. Phosphatidylglycerol and cardiolipinlevels in unknown sampled are determined based on the provided cardiolipin standard curve.